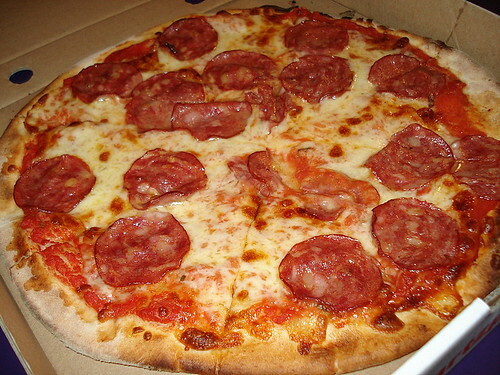 Salamino pizza S$17.50, originally uploaded by Camemberu. We had this on Sunday but I couldn't bring myself to post it til today (and even so, it's with some difficulty). The "jelak" (over-satiated) feeling is still with me, so can't really bear to look at another pizza. But anyway, this is our first taste of the much-discussed Artz Pizza, which now delivers (limited areas)! The guys behind this joint are the folks who started Al Forno (which they sold off) and the first to bake pizza here in a traditional wood oven. The Salamino pizza tasted better of the two that we had. Yes, both came piping hot with thin crusts and fairly good quality ingredients. But our first bite (and subsequent ones) still lacked the "wow" factor. 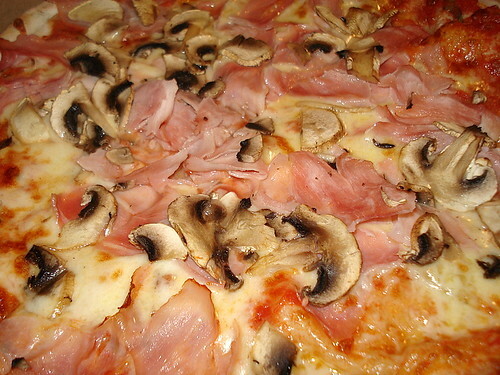 Prosciutto & Funghi Pizza S$18.00, originally uploaded by Camemberu. Hubby hates prosciutto (he thinks it smelly) but I love it. Strangely, the mushrooms smelt stronger than the ham. They were still half-raw, most of them. But this was not what bugged us - there was this other smell (some sort of tiny shredded leafy herb perhaps) that was very strong and did not agree with us. We could not figure out what it was. This applied to both pizzas. It wasn't the crust, mozzarella or the tomato base. 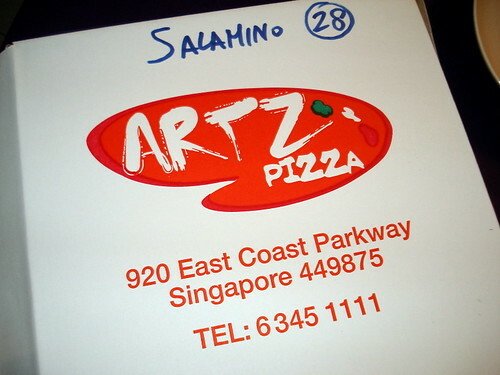 Artz Pizza delivers to limited areas, originally uploaded by Camemberu. All pizzas are 12-inch. Order one and get the next at half price. Order two pizzas and get the third one free. Fifteen types available. Delivery is free (no minimum order required). At least it is edible. I threw a piece of pizzahut at my dog. He took a sniff and ran away. I have not tried the home delivery but ate at the place itself. It's one of the better pizzas I've tried and you could still give it a chance! pizza-hater, lol, that is funny! Jason, yeah I might. But not too soon. Hehe. I like pizza so much specially all toppings wow! that was so delicious. Yummy!! !